Gen. Wojciech Jaruzelski, the survivor of a Siberian labor camp, was an unlikely servant to the Soviet Union and its communist ideology. Poland's last communist leader, the general in tinted glasses who was best known for his 1981 martial law crackdown on the Solidarity union, died Sunday at age 90 after a long struggle with cancer and a recent stroke. Born into a patriotic and Catholic Polish milieu, Jaruzelski and his family were deported to Siberia by the Red Army during World War II. That harsh land took his father's life and inflicted snow blindness on Jaruzelski, forcing him to wear dark glasses. Despite his suffering at Soviet hands, Jaruzelski faithfully imposed Moscow's will on his subjugated nation until communism crumbled across the region in 1989. Poland is still deeply divided over whether to view Jaruzelski as a traitor who did Moscow's dirty work or as a patriot who made an agonizing decision to spare the country the bloodshed of a Soviet invasion. Jaruzelski stirs up these emotions for his defining act: His 1981 imposition of martial law, a harsh crackdown aimed at crushing the pro-democracy Solidarity movement founded months earlier by Lech Walesa. One of his chief adversaries, communist-era dissident Adam Michnik, believes now that general had no choice. "If you have to choose between martial law and a Russian military intervention, you should not hesitate," Michnik told The Associated Press on Sunday. "It's clear that it was the lesser evil." Jaruzelski preferred to be remembered for the negotiations he backed eight years later that helped dismantle the regime and set Poland on track to become the thriving democracy it is today. The suppression of Solidarity resulted in the imprisonment of thousands of dissidents, the deaths of dozens and economic stagnation. "A tragic believer in Communism who made a pact with the devil in good faith" is how the Croatian writer Slavenka Drakulic described Jaruzelski. 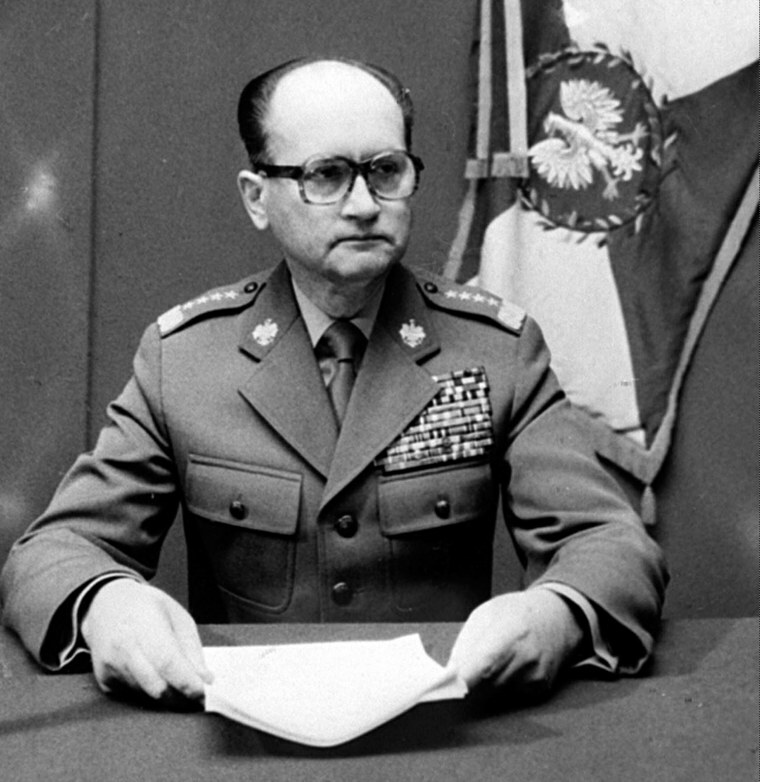 The image of Jaruzelski in his drab olive military uniform announcing martial law on state television remains iconic to Poles. Straight-backed and betraying no emotion, he read from documents as he announced martial law and the outlawing of Solidarity, the first independent labor union in the communist bloc. "The Polish-Soviet alliance is, and will remain, the foundation of Poland's state interest," he said. In his old age, Jaruzelski battled legal charges over imposing the clampdown and for crushing a 1970 workers' strike when he was defense minister that left dozens dead. As he underwent chemotherapy for cancer in 2011, a Warsaw court excused him from participating in the two trials. He battled heart problems, pneumonia and cancer that eventually led doctors to declare him unfit to stand trial. He said he wanted his gravestone to say: Wojciech Jaruzelski — General.